In this sitcom, a quartet of extremely intelligent roommates have a lot going for them. Unfortunately, social skills are not among their blessings, so the show follows their misadventures as they try to manage normal human relationships. The series has been one of the most popular on television since its debut. Penny tries to seduce an abstaining Leonard to ruin his "donation" for her ex-boyfriend, Zack, and his wife, Marissa. Also, Wolowitz, Bernadette, Anu and Koothrappali turn Koothrappali's canceled bachelor party into a couple's trip aboard the "vomit comet,"
Life gets complicated when Stuart starts bringing his new girlfriend home; Penny and Leonard talk about starting a family; Koothrappali explores an arranged marriage. Sheldon and Amy go crazy trying to figure out what "perfect gift" Leonard and Penny gave them for their wedding; Koothrappali decides to settle down and asks his father to arrange a marriage for him. Amy's parents arrive for the wedding, along with Sheldon's family. Everybody is focused on making sure all the arrangements for the big day go according to plan - everyone except the bride and groom. When Sheldon learns that his mother won't attend his wedding unless he invites his brother, Georgie, he and Leonard travel to Texas to end a family feud. Also, the Wolowitz kids inadvertently infest Amy, Bernadette, Wolowitz and Koothrappali with pinkeye. Sheldon's comic book store experiences changes when writer Neil Gaiman puts Stuart's store on the map. Also, Koothrappali takes credit for Penny's astronomical discovery, and friendships are threatened. A brilliant but reclusive scientist, Doctor Wolcott, invites Sheldon to his cabin in the middle of nowhere, and Leonard, Raj and Howard go along for the trip. Also, Penny and Bernadette improvise after Amy doesn't like the tame bachelorette party they planned for her. Howard and Sheldon bond when they drive to the desert to shoot off a model rocket. Also, when Leonard's mom, Beverly, finds a new best friend in Penny, it rubs Leonard the wrong way. Amy gives Sheldon an answer to his proposal while Howard and Bernadette struggle with some unexpected news. The 'Big Bang' star has strong words for those who think she looks like she's with child. The network decides it doesn't have to give tons of money to the CEO it fired this year. The 'Big Bang' star will become DC's unstable villain. How Will 'Big Bang Theory' End? The show's producers have plenty of ideas for what they're not going to do in the final season. The 'Big Bang' star has made his new relationship Instagram official. The news sparked tears from both cast and fans. Is 'Big Bang Theory' Coming to an End? Rumors have been flying that the sitcom has just one more season left. Believe it or not, fall premiere season is just around the corner. The procedure happened just days after her wedding. The 'Big Bang' star really loves horses. The incident resulted in at least one cancelled show. Finally, he's doing something important. Johnny Galecki may have just dropped a big hint about the show's future. The 'Big Bang' star has a new baby girl. The 'Big Bang' star is having a great time going back to his TV roots. The Big Bang Theory is currently available to watch free on CBS and stream on CBS. 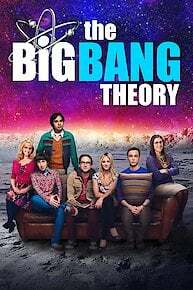 You can also stream, download, buy, rent The Big Bang Theory on demand at Amazon, Vudu, TBS, FuboTV, Sling, FandangoNow, Google Play, iTunes online.